At Bricksite you won't get lost in a maze of technicalities. Your website is visible all the time, and when editing you can see small icons next to all editable elements. It is therefore easy to make your creative ideas a reality on the screen. In short, Bricksite is a simpe CMS (content management system) - but with lots of possibilities. We have made some important decisions for you! The result is a system where you can literally create your own website in a few minutes - and communicate your messages to the world at large. Our ready-made design templates give you a safe and quick start. But our design templates are not more ready-made than you can use our design tools to adjust them to your specific design requirements. Your own logo, colours, background and dimensions - only a few clicks away! 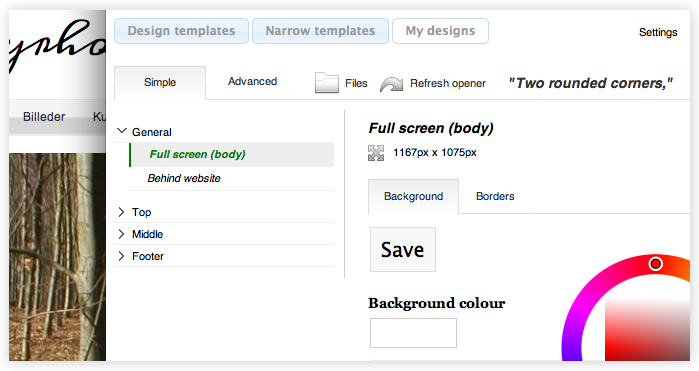 At Bricksite you can choose from all our free design templates and activate them by a single click of your mouse. You can change the template without altering the contents of your website. If you wish to see how a new design template fits your website, you can also use the preview mode to see the template on the website before activating it. We add new templates every month. With Design Studio you can adjust all design templates. Whether you wish to change the colour of the menu in a pre-made design template or start entirely from scratch in a new template, Design Studio is simply the easy way to a good result. Design Studio contains both a simple and advanced editor. In both versions you get access to a series of pre-defined website elements, which you can adjust according to your own needs and requirements. The simple version contains elements like colour selectors, upload of your own files as background, change of dimensions etc. If you wish to write your own CSS, the advanced version can be used alone or as a supplement to the inituitive simple editor. In summary: Design Studio is both for users who have no experience with website design but wish to make minor changes, and for users who know CSS and are looking for a quick and reliable design solution. When creating your Bricksite account, you can choose an address for your website (e.g. www.bricksite.com/yourname). You can always use this address, but many users like to have their own domain name. In the system-based webshop, you can easily buy your own domain name. 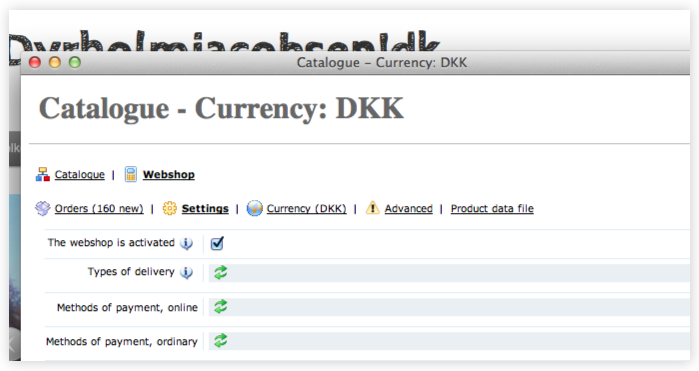 Currently we only sell .dk domains, but we are working on extending our services to other types of domains, e.g. .com. However, you can always point any domain name at your website (via your own DNS administration). Point a domain name at your website: .com, .net, .info - you name it! If you wish to control DNS for your domain, you can buy a feature via the system which allows you to point any domain at your website. Here you will receive the relevant ip addresss, and you can follow our many instructions in the support system if you need help with the technicalities. 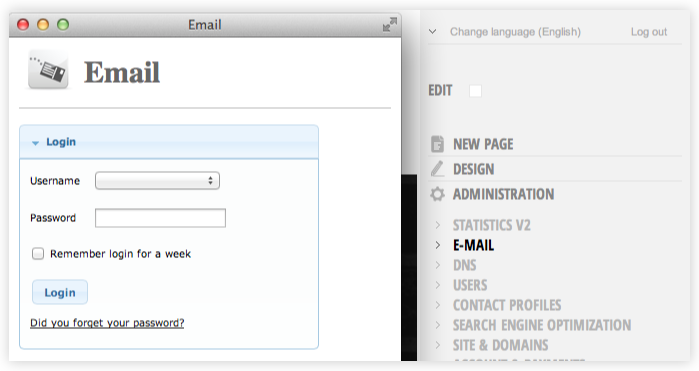 Currently we offer you email subscriptions on .dk domains which are hosted by us. However, many users choose a free email account or their own email supplier. This is entirely up to you." Pictures are a very important part of your website! Therefore it is important that you have good tools to both administer and display your pictures. It is not easy to describe the effects of pictures, slideshows etc. 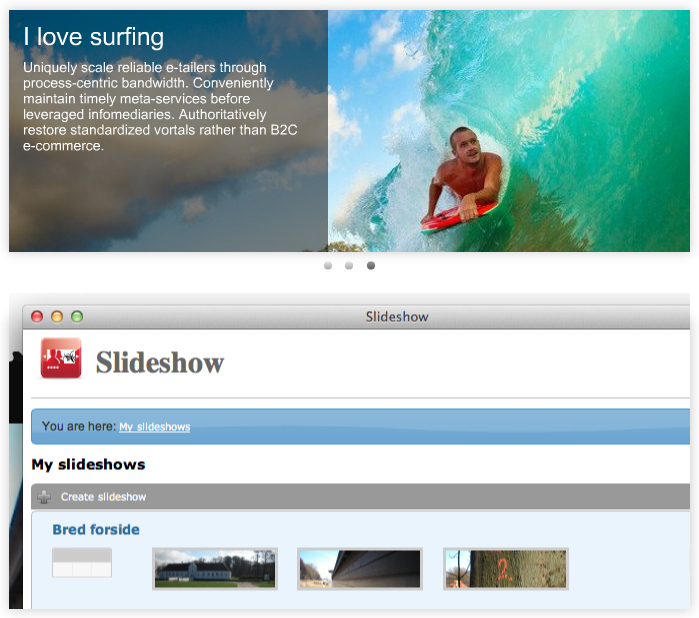 So check out this demo website and see an example of an exciting slideshow from Bricksite. Do you need a simple webshop? No problem! Part of Bricksite's 100% free basic package is a catalogue module. Here you can create your own products, paintings...well, everything under the sun. The module makes it easier for you to present a ""catalogue"" of all that is relevant for your business. You can insert the full catalogue or selected products and categories on your website. The catalogue module can easily be extended into a simple webshop. Here your products will be equipped with an ""add to basket"" button, which allows your visitors to place orders in your webshop. If you wish to offer online payment, you can also expand with PayPal integration. In addition, we currently offer integration with Dandomain's payment gateway. A website is most useful when someone finds it! We all know how important it is to be visible to search engines. Bricksite will help you with this challenge. Comprehensive search engine optimization can be a complicated process, but that doesn't mean that you can't achieve great results with some basic skills. At Bricksite you can control page urls/the address lines of the pages. For instance, you can choose whether your product page should be called domain.dk/products or domain.dk/cheap-coffee-filters. In addition, you can enter meta title and description at a general level or for each individual page. The system also generates an xml-sitemap of all your pages. When a website is moved from one system to another, it is important to know how to redirect the page addresses/urls. One of our modules focuses on this challenge and allows you to create redirects (301-redirects) from your previous urls to any new urls at Bricksite. In this way, you can tell both the search engine robots and your visitors where your pages are. 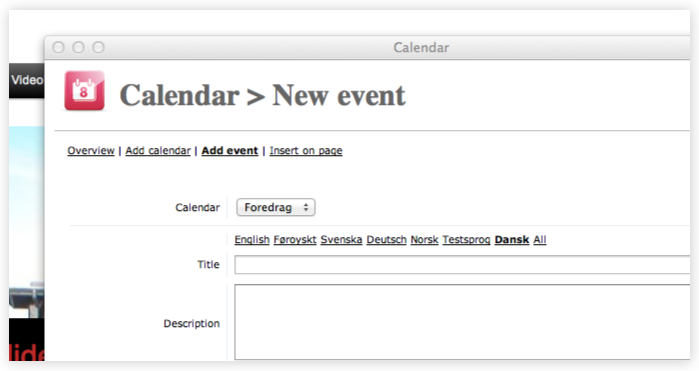 The Bricksite calendar module makes it easy for you to present your events on the website. The module is perfect as an event calendar, and to make it all clear and easy you can divide your events onto different calendars with individual colours. The module also supports iCal-feeds so that you can add events from your Google calendar etc. Events can either be presented via a list or a traditional grid. Some parts of a website are more dynamic than other parts. It could be news on the front page, weekly articles, a travel journal etc. At Bricksite we have created a universal tool for all these elements - a blog module. This module contains the most conventional blog elements like posts, categories, tags etc., which makes it ideal for users who need a traditional blog. 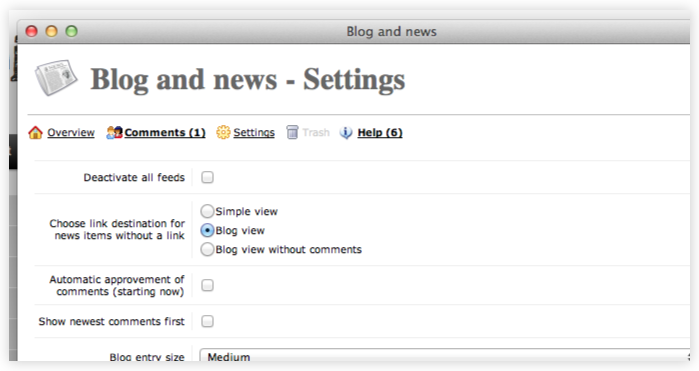 The blog module kan also be used as a normal news module if you wish to present front-page headlines of your family's or company's latest achievements. Each news item can redirect your visitors to a random page or further reading. 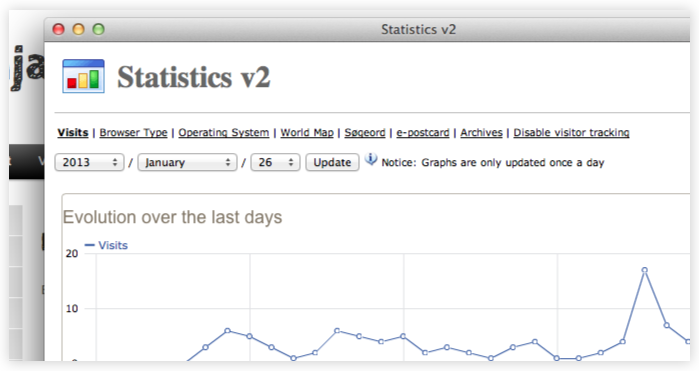 How many people (and who) visit your website? At Bricksite you can choose to use Google Analytics or our own integrated module. Both tools can be activated with just a few clicks of your mouse. Bricksite's own statistics module provides you with an overview of the number of visitors - and you can also see where they come from and which words they have used in search engines like Google to find your website. We could go on and on, but you'll get the best impression by creating your own website!